After four months of a blissful marriage, Paige is devastated to overhear her husband, Cooper, say those words to his best friend. 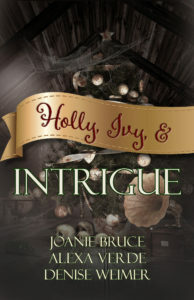 Because of a suspicious Christmas gift, a gas leak, and a home invasion, Paige’s love for Cooper is tested to the limit. Will their marriage survive the Christmas Murder Mix-up? Kelsey Jordan prefers upcycling junk and refinishing antiques for her store in a Georgia mountains town to being the center of attention. When a robbery and an unknown benefactor shove her in the middle of a decades-old mystery, and a real estate developer and a former baseball star compete for her attention, Kelsey isn’t sure who to trust. Love sneaks up on eight couples in the Old West. The Old West comes to life under the talented pen of bestselling author Mary Connealy. 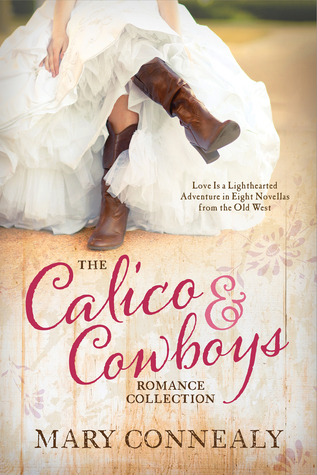 Enjoy a lighthearted ride alongside seven historical and one contemporary cowboys and the women who tame their hearts. Melanie Douglas is alone on the Nebraska plains, teaching school to get by. She finds a unique box with hidden drawers to use over the advent season to engage a young boy in his schooling. When Henry O’Keeffe sees a positive change in his son, he has to see for himself what this new teacher is doing. Matt Reeves arrives at his brother’s ranch to find Betsy Harden alone with the little girls during a cattle drive. Will the ladies be too much to handle when Matt steps in for the missing ranch hand? A lonely young rancher orders a mail-order bride and after the vows are spoken, she “surprises” him with her three little brothers. No amount of apologies Meghan McCray gives are going to make Silas Harden, Jr. believe a word she says. Should Silas just build himself another house and let his mail-order family take over the one he’s got? From the publisher of the USA TODAY bestselling & #1 Amazon bestselling Timeless Romance Anthology series in Clean & Wholesome Romance, comes FALLING FOR A DUKE. ON THE DUKE’S ERRAND by Rebecca Connolly. Lord David Chambers has one goal—to put his father’s Scotland estate to rights. Even if it means leaving in the middle of the London Season and avoiding the matchmakers. As the second son of a duke, David looks forward to facing the wilds of Scotland, and trying to make something of himself and prove his worth to his father. But David’s not prepared for the censure he receives from the local Scottish gentry, especially Ceana Shaw, the baronet’s daughter who not only mistakes him for the duke himself, she seems determined to think the worst of David. VINGT-ET-UN | TWENTY-ONE by Nichole Van. Eliza Mail had found the perfect place to live out her days as a young widow, away from the pain of her past and lost love. Seemingly by chance, Eliza’s childhood neighbor, Liam Trebor, Duke of Chawton, comes to her village for a visit. Eliza hasn’t seen Liam in over five years, and his presence panics her. Will he reveal what he knows to her friends and neighbors, destroying her current life? Eliza must avoid Liam at all costs, but he seems equally determined to flush her out of hiding. What happens if Eliza’s past does not stay where it belongs . . . in her past? I KISSED A DUKE by Janelle Daniels. Madeline Maybury will do anything to be invited into the inner circles of the ton. She takes on a challenge from a high society lady to kiss the Duke of Hargrave. When she finds Ethan alone and explains that she needs to kiss him, instead of turning her away, he’s amused. He also obliges. Madeline believes she can report back and achieve all of her ambitions. Instead, she’s given an even greater task. Once she accomplishes it, she realizes that the Duke of Hargrave is a very different man than she expected, and she’s in grave danger of falling in love. I love the Regency period. There is just something about all of the pomp and circumstance of the era. Although, if I lived during that time, I’m pretty sure I would have lived below stairs. That’s probably part of the fun of immersing myself in the aristocracy’s lives. 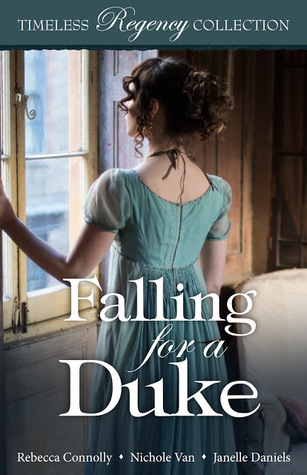 Falling for a Duke includes three novellas that focus on those in the very upper levels of the ton. They’re not all what you might think they’d be either. One hero isn’t even a duke! But that’s what makes that story original and delightful. Another involves childhood friends who are separated by misunderstandings and a meddling family member. And the third one takes place because of a dare. Each of these is different enough I didn’t feel like I was reading the same story three times. There were things I loved with each of them—the humor in the first, the friendship in the second, and the surprise in the third. It’s a collection worth immersing yourself in. ***I receive complimentary books for review from publishers, publicists, and/or authors, including NetGalley. I am not required to write positive reviews. The opinions I have expressed are my own. I am disclosing this in accordance with the Federal Trade Commission’s 16 CFR, Part 255. I’ve missed the fun monthly wedding novellas that Zondervan gave readers the past two years. If you missed them, I have good news. 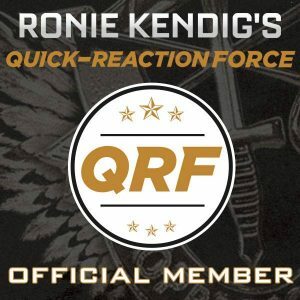 They are re-releasing these short and fun stories in groups of three (plus you can get your hands on a hard copy this way instead of the eBooks). 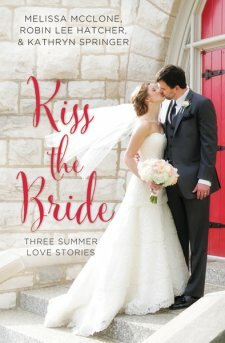 In Kiss the Bride, readers will enjoy novellas from Melissa McClone, Robin Lee Hatcher and Kathryn Springer. Each of the heroines works in some shape or form in the wedding industry and each of them embarks on their own journey toward true love. In “Picture Perfect Love,” Jenna Harrison is finally experience success in her wedding photography business after a devastating and public breakup during her wedding rehearsal. When her ex shows up on her doorstep, she’d determined to forgive him but she’s moved on…or has she? Robin Lee Hatcher’s “I Hope You Dance” brings readers back to King’s Meadow, Idaho and the pretty dance instructor Skye Foster. As the wedding for mutual friends approaches, Chef Grant Nichols appreciates the dance lessons Skye offers. The more time the two spend together, the more sparks fly between Grant and Skye. In the final installment, “Love on a Deadline,” Mackenzie “Mac” Davis has returned home to Red Leaf, Wisconsin and taken a job at a local newspaper. When her editor assigns her the job of following all of the festivities for her high school nemesis, Mac balks at the assignment. But maybe spending time with the bride’s older brother—Mac’s first crush—will make the wedding craziness worth the headaches. Last year I awaited each of these novella releases each month. Now readers can get three at one time and enjoy the wonder and awe of falling in love. The shorter novella (each about 100 pages) offers a quick and fun read with a happily ever after. ***Booklook Bloggers and Zondervan provided me with a complimentary copy of this book in exchange for an honest and fair review. All opinions expressed are my own.